It has been one month since my surgery with Dr. Arvind. I went for 4500 FUHT, but I think the actual number of grafts was 4610. Everyone at Dr. A’s clinic was very warm and helpful. They answered all of my questions and made me feel very at ease. I have some photos to update you on my progress. I didn’t feel any pain during the procedure. They even used a mirror and my camcorder so I could checkout what they were doing. It has been one month since my surgery. 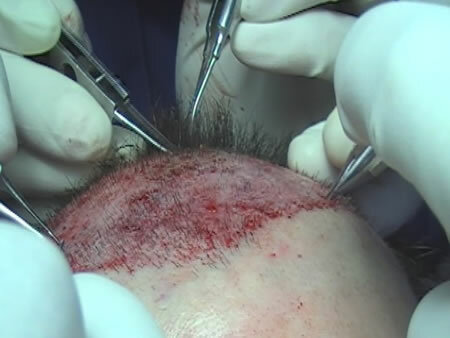 Most of the transplanted hair has shed (which is normal). I have begun “the doldrums” period, while I wait for the new hair to sprout. 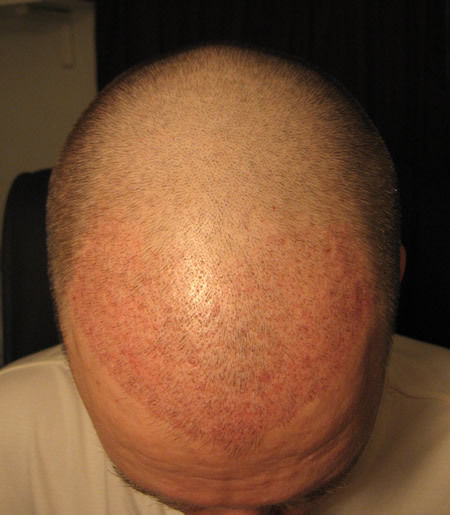 I have been keeping my hair short so I can apply Huridoid cream and scar gel to the donor scar. The recipient area is still pink which I find annoying. I had expected it to fade by now. The most worrisome part now is the shock loss around the donar scar. I have lost about a 1/4 inch (1/2 cm) of hair just below the incision scar. I am really hoping that hair will grow back. 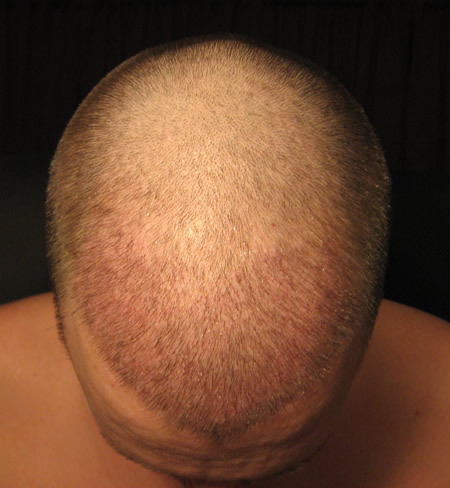 Even if my scar looks thin, a big line of no hair will make it impossible to keep a short hair style. What do you guys think? Have any of you experienced a bit of shock loss near the donor scar? Did that hair come back? Take a look at my photos and let me know what you think of my progress. I am anxious to hear your opinions. The work looks great! 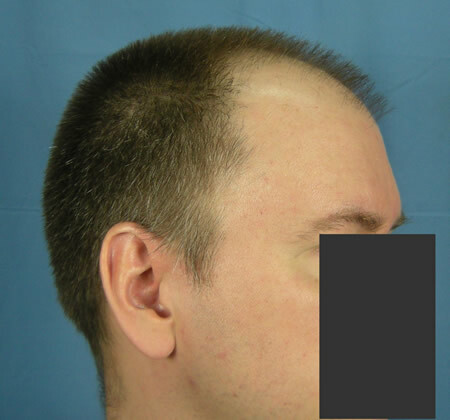 I too like the hairline with the pointed finish at the temples rather than the overly rounded look. Did you ask for the temple points? 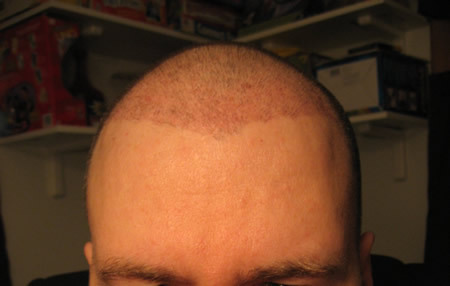 Actually, I just gave him a general idea of where my original hairline was, and let him know I wanted a dense hairline. Then I just let him do his thing… If you hire an artist, you’re better off not telling him how to paint a good picture. 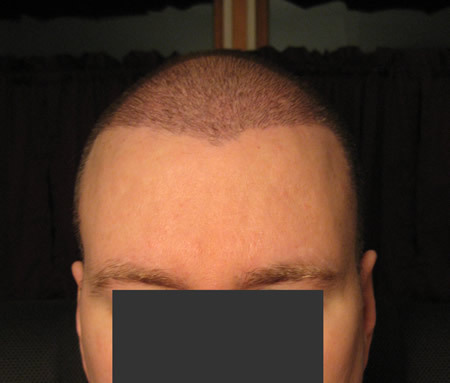 I know Dr. Arvind has looked at far more hairlines than I ever will, so I let him do his thing. When I first saw the hairline, I was a bit surprised, because it isn’t like my original hairline that I had when I was young. I wasn’t sure if i liked it, but the more I look at it, the better I like it. I wont really know what it’s going to look like until my hair grows in. I can tell you that the angulation is perfect. It exactly matches my existing hair and the way my hair grew in those areas when I was young. I might be wrong but I think hair lines designed with pointy angulation usually look nicer than the round or oval shape hair lines, it is more stylish with the edges and angles, I too would love to see how it turns out for you. If you hire an artist, you’re better off not telling him how to paint a good picture. I know Dr. Arvind has looked at far more hairlines than I ever will, so I let him do his thing. Well said HairProject, look forward to updates, good luck! Thanks guys, but what do you think about the donor scar? How does it look for 4 weeks? If you go to my Picasa Photo Album, you can use the download link to get a high resolution version of the pictures. 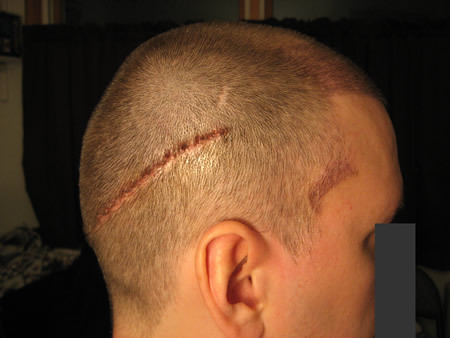 Has anyone else experience a small amount of shock loss around the donor scar similar to mine? Did any of that hair come back? » version of the pictures. » scar similar to mine? Did any of that hair come back? It’s too early to tell, why didn’t you do FUE? Did Dr. Arvind tell you he does FUE ? I was aware that Dr. Arvind does FUE. 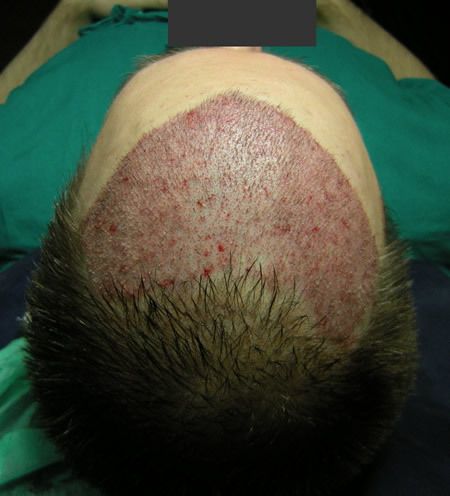 However, after doing my research, I decided FUHT was the way to go for my first procedure, due to the number of grafts. From what I have seen, for vary large sessions, strip procedures have a slightly better graft survival rate. I generally heal fast and I dont have a problem with excessive scarring. You may notice a few pre-existing scars in my donor area. These were all caused by blunt force trama and I opted not to get sutures. They healed rather well considering the condition of original injuries. 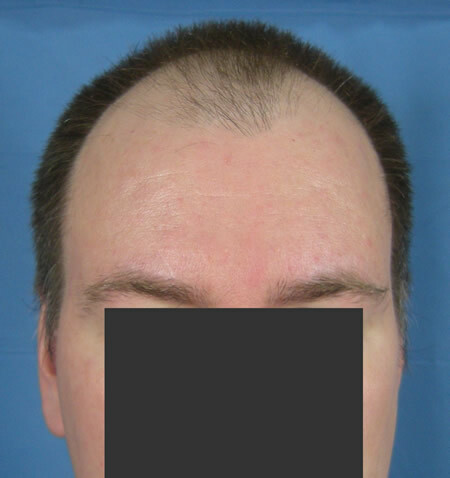 I plan to use FUE for any future procedures, but that’s been my plan from the start. 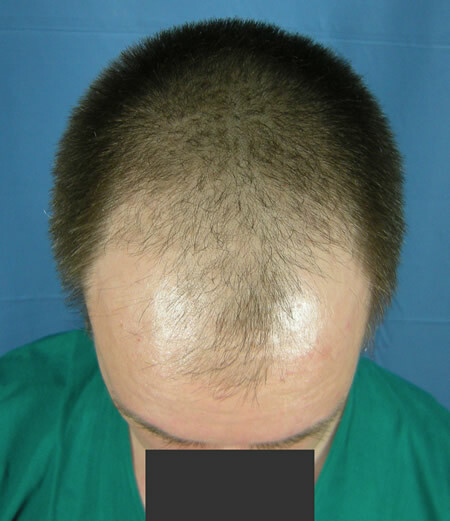 Strip for the first large procedure, and FUE for any smaller additional procedures. If the scar is too wide, I will have grafts implanted into the scar. However I am hoping for the best. 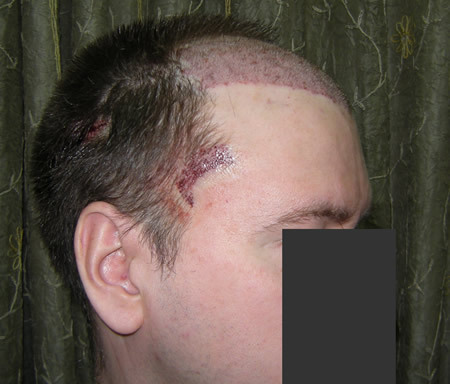 I have alopecia occurring around my donor scars, however, my circumstances are different to yours I’ve had multiple small strips and scalp reduction surgeries. 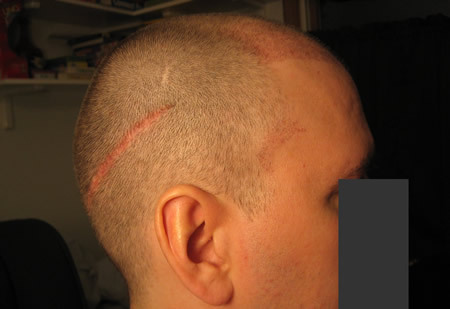 I consider myself to be lucky…with the trauma my scalp has endured, the back of my head could be a lot worst. Your right, his HT is very similar to mine! He looks great, and he is only just under 5 months. That would be late June for me. That is very encouraging. Thanks! I think he has more hair coming too. He must be very happy. The waiting is harder than I thought. So I say, if you go for Arvind… if he is as good as his word, and you have the faith…give the scar a miss, pay the extra and go FUE. » have the faith…give the scar a miss, pay the extra and go FUE. It’s typical bait and switch tactics, doctors will tell you that fue yield is poor so that they can sell you a strip.